You never dreamed being the boss would be so hard. You're caught in a web of conflicting expectations from subordinates, your supervisor, peers, and customers. You're not alone. 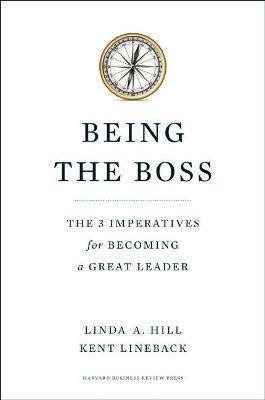 As Linda Hill and Kent Lineback reveal in Being the Boss, becoming an effective manager is a painful, difficult journey. It's trial and error, endless effort, and slowly acquired personal insight. Many managers never complete the journey. At best, they just learn to get by. At worst, they become terrible bosses. This new book explains how to avoid that fate, by mastering three imperatives: * Manage yourself: Learn that management isn't about getting things done yourself. It's about accomplishing things through others. * Manage a network: Understand how power and influence work in your organization and build a network of mutually beneficial relationships to navigate your company's complex political environment. * Manage a team: Forge a high-performing "we" out of all the "I"s who report to you. Packed with compelling stories and practical guidance, Being the Boss is an indispensable guide for not only first-time managers but all managers seeking to master the most daunting challenges of leadership. Named one of Five Best Business Books to Read for Your Career in 2011 by the Wall Street Journal . Linda A. Hill is the Wallace Brett Donham Professor of Business Administration at the Harvard Business School, the faculty chair of the Leadership Initiative, and author of Becoming a Manager. Kent Lineback, now a coach, writer, and collaborator, spent nearly thirty years as a manager and executive in business and government. He is the coauthor (with Randy Komisar) of the bestseller The Monk and the Riddle.